There is always a thrill of finding an awesome garage sale find. 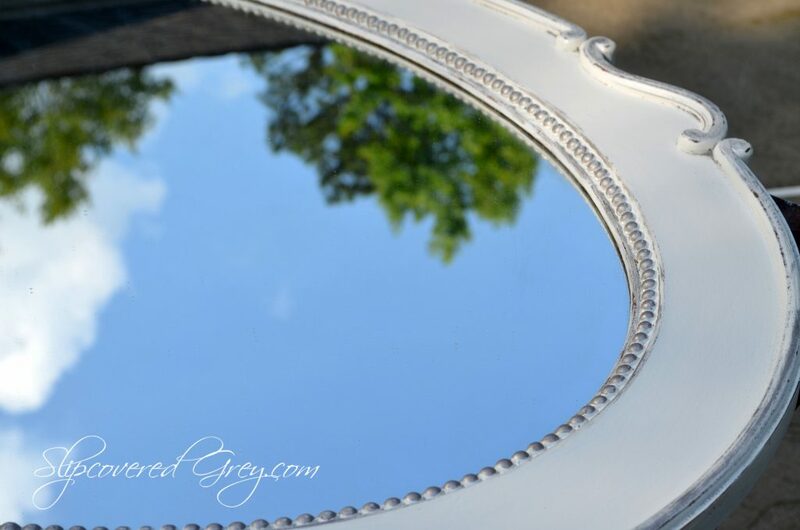 This time I found it – a vintage mirror that needed a little “glam” makeover. 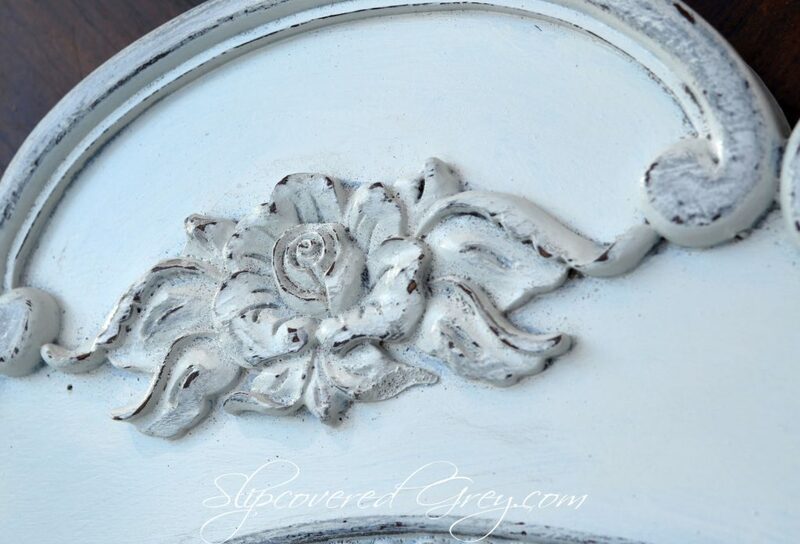 The lines and carved floral detail would be beautiful painted. 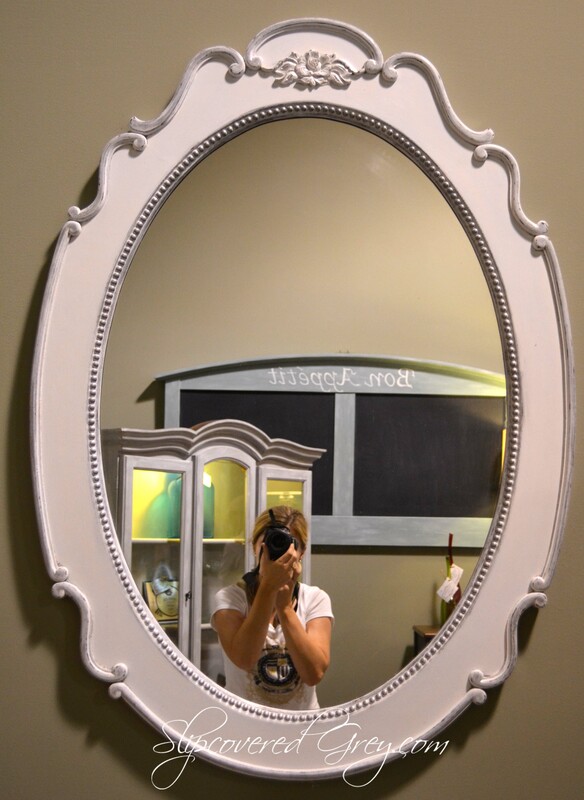 I knew this mirror could be transformed into a stunning piece no longer a pass me by at a garage sale. I really liked the detailing and thought the chips and nicks could be painted and “glammed” up nicely. Here is how it looked with a little makeover. This picture is not a close up, so let’s get close up. 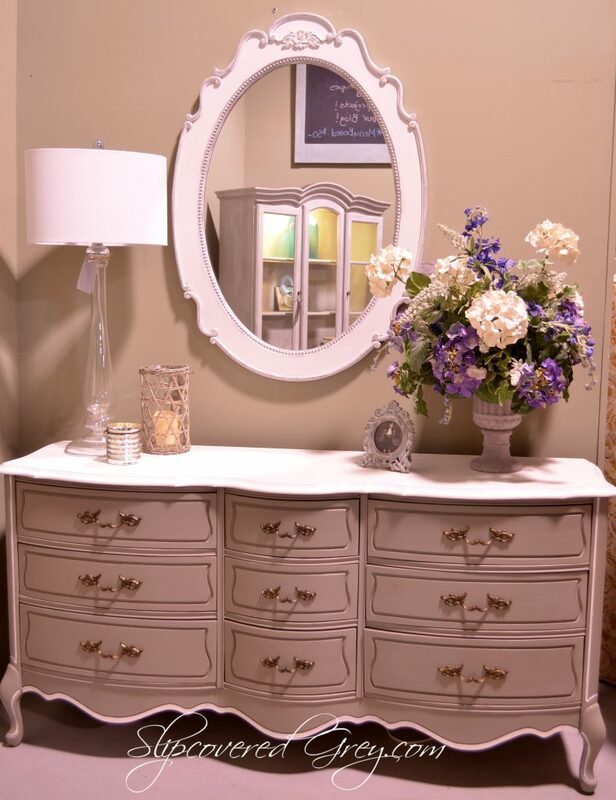 The mirror was first painted with Annie Sloan Pure White. Annie Sloan is so easy to use and covers great! 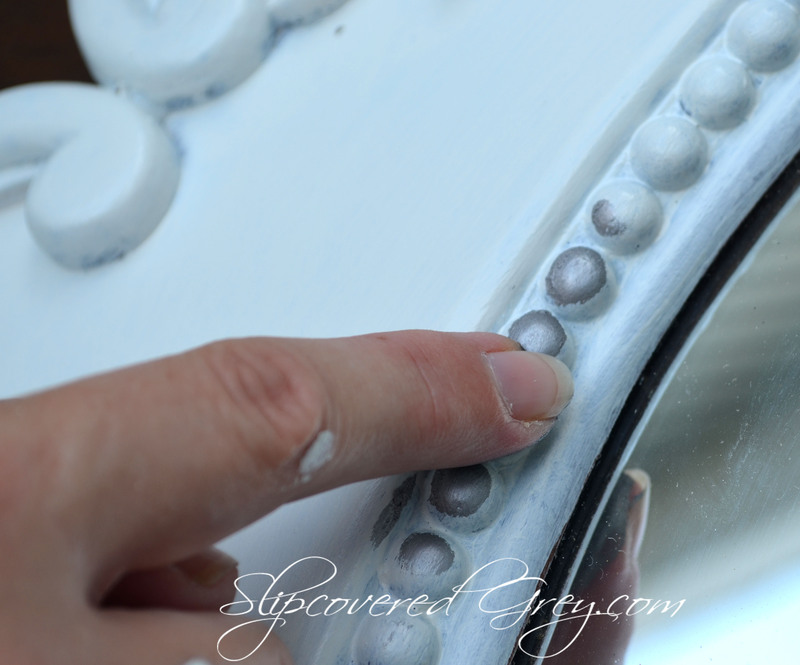 I have found that Pure White takes two, if not three coats of paint, but it is so much easier than priming any day. After painting white, I used a little Pewter Rub ‘n Buff in areas. Yes, I know, I need a manicure and don’t you just love the paint all over my hands? 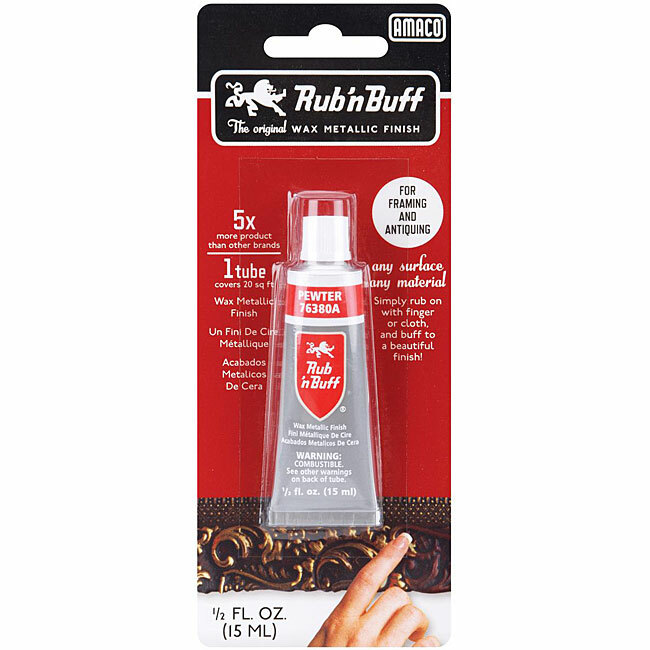 Rub ‘n Buff has great coverage and is easy to apply. 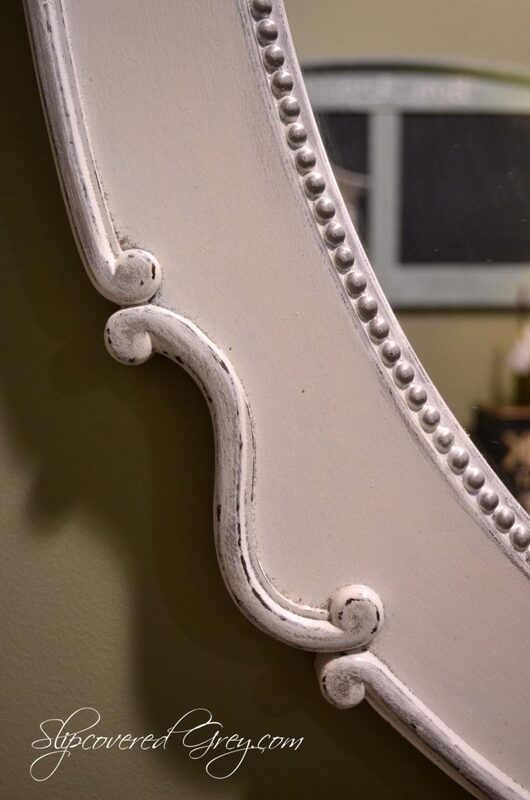 I put a little on my fingertip and applied it to the “pearl” looking balls around the inside of the mirror and distressed lightly. I also added Rub ‘n Buff to the scroll detailing to the perimeter of the mirror. 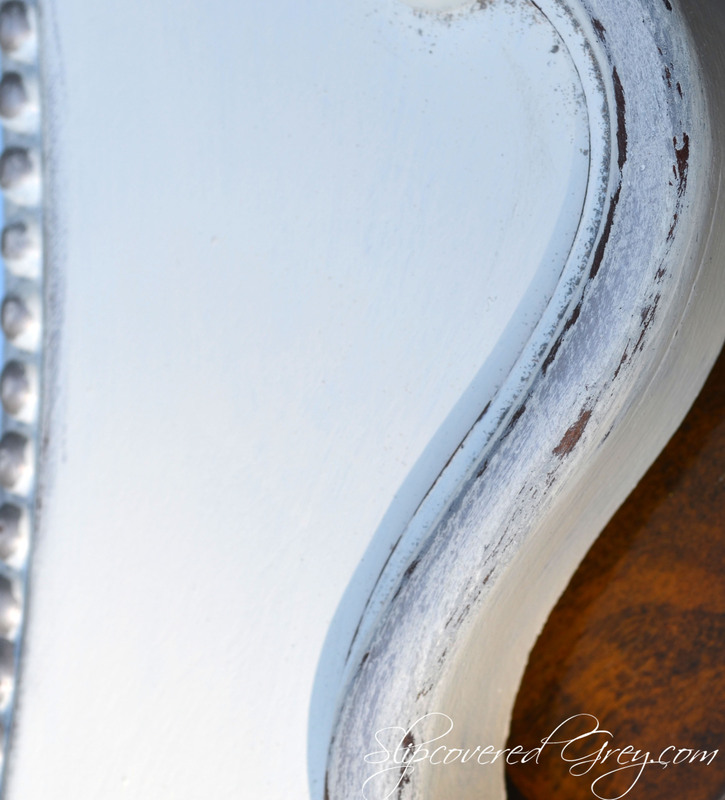 Lightly distressing these areas gives dimension and texture. Here is more dimension and texture on the scroll of the mirror. Very little pewter was added to the flower. The flower was mostly distressed to achieve this look. Angie, this looks lovely! I’m a Rub N’ Buff girl too! Your mirror is fabulous! It looks so pretty! I haven’t used Rub N’ Buff before but I love the effect. Thank you! Yes, Rub n’ Buff works great and is inexpensive too. Give it a try. I think you would like it. I stopped by and just wanted to commend you for the lovely details you provide. Your work is absolutely beautiful! I am a beginner and the details and visuals you provide are very much appreciated! Lovely website, I will be back, thanks!